The Sphere Console. 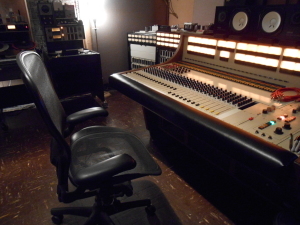 –Our recording console is a Rare and legendary 1970’s Sphere Eclipse A. The Sphere Console was a top of the line custom mixing desk made from the early to mid 1970’s. Sphere made approximately 50 and of those, only 23-25 are known to still exist…. on the planet! These remaining Sphere consoles are Holy Grail mixing consoles…from the stone age of modern console design! Our Sphere features 28 channels of Class A transformer balanced microphone preamps that are well regarded for their clear, warm and punchy sound. This desk has 16 busses and is filled with a mixture of the famous graphic 910/920 EQs (these eq’s are so good that these are frequently pulled out, racked up for outboard tracking/mixing and even used by some mastering engineers). This desk was recently gone through, restored and is fully functional. We had brand new aux/cue modules built, that update the original somewhat limited aux section. Now this desk has more flexibility for effects and headphone mixes while also incorporating a “small fader” section to have a separate pre and post tape section making it truly a modern inline console. 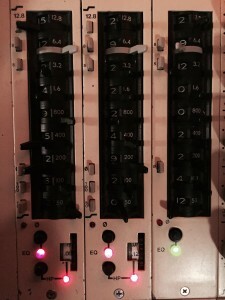 The recording console and tape machine combination is the heart and soul of any studio. We are lucky enough to have the real deal and feature this rare Sphere Eclipse A and an Ampex 2 inch 16 track tape machine. The combination of these two transformer balanced, class A, beasts is simply…. analog recording nirvana. Add some classic microphones and classic compression, and you are doing the best you can for your album. As a side note the the sound of the eq in this console, read from a TapeOp review of Jim Putnam (the son of Bill Putnam…) he remarks on HIS Sphere Eclipse… ”For those that might not know, Jim Putnam is one of the two Putnam brothers, the other being Bill Jr. that re-founded Universal Audio, their father being Bill Putnam Sr., the man who invented the modern mixing console and the 1176 and LA-2A compressors. (Both interviewed in Tape Op 24) Jim is also the singer/songwriter/guitarist with the Radar Brothers. At a recent press event for UA’s new UAD-2 card at Broken Radio Studios, the legendary Coast Recorders room built by Bill Putman Sr. and now run by Tape Op contributor Matt Boudreau, I was pleasantly surprised to see both Bill and and Jim there….Like all the the previous Radar Bros. discs, this one was recorded by Jim in his studio, Phase Four Intergalactic Recording, on two inch 24 track tape with his Sphere Eclipse console and mixed to analog 1/2″ tape. Jim’s had the Sphere for a couple of years now and is stoked on it. It has the paragraphic EQs which he says are “the best sounding EQs I’ve ever heard.” Jim has some cool old vintage gear, UA and otherwise, in his studio so this is a statement to be taken seriously. Sphere consoles where custom made and cost a small fortune at the time. A who’s who of big name artists and studios ordered Spheres. Who? Sigma studios, Brian Ahearn, the Grand Ole Opry (which is our Sphere, specifically it was custom made for their recording broadcast truck! ), The White House(!?) (the white house desk was in service for over 30 years!, and recently replaced with a digital board…do you think that the new digital board will last 30 years? )basically the artists and companies who back in the day, could afford anything…chose Sphere in the early 70’s. I could (and will) go on and on about these amazing consoles and why they are so good. So, in a future blog I will give more details of the full and story about Sphere.